It’s not surprising that the Savior, Yahshua Messiah, said only fools would be slow to believe all that the Prophets of Yahweh have spoken. Follow the Scriptures in your bible and you will see what I mean. Yahweh’s Prophet Daniyl actually spoke of this present generation of nuclear knowledge. When you couple his words with Yahshua Messiah’s Words, you see, without a doubt, that we are in the last part of the Last Generation given to mankind by the Creator Yahweh to prove that the activities of rebellion, chosen by mankind, against Yahweh’s Laws of health, joy, and peace, will lead to nuclear burning. 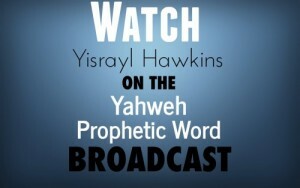 Yahweh’s Prophet Isayah showed The End and the cause. Daniyl showed the how and the time period. The Savior, Yahshua Messiah, showed the generation, the hatred, deception, mankind’s health condition of confused minds, and the world’s condition of mourning and fading away, plus the nuclear possibilities. These combined Prophecies altogether show that the coming months will not be pleasant, and few people will live through what is rapidly coming. Did you catch what was said here…evil like the Gods? Now, Cain, the son of Eve and Adam is an example of being evil like the Gods. …for there shall be continual war, vengeance, and retaliation. 13 Yahweh will make you the head, and not the tail. You will be at the top only, and never be at the bottom, if you will pay attention to the Laws of Yahweh your Father, which I command you this day, and are thencareful to observe and do them. These blessings are received by practicing the Righteousness of Yahweh. But notice what is said in verse 14,going after any God to serve. Remember, evil like the Gods. Genesis 3:5 says you will be as Gods, knowing evil. Following, practicing, or knowing evil brings curses…the curses we see in abundance in this present generation. There are 41 wars being fought around the world right now. But this week, one of those wars reached into the sky and grabbed 298 people who could have been any of us. Scott Pelley reports. There are 41 wars being fought around the world right now. Most of us are busy and we race through our weeks without paying a great deal of attention, but yesterday this week stopped, because one of those wars reached into the sky and grabbed 298 people who could have been any of us. 12CBS’ Scott Pelley, commenting on our shared humanity, after the missile attack of Malaysia Airlines flight MH17. In the very beginning, Yahweh prophesied to Cain that there would be continual war by not practicing Righteousness. The way of Cain is seen in Genesis 4:7; not practicing Righteousness but instead practicing sin. Genesis 4:7shows that sin and the desire to sin can be overcome by practicing Righteousness and not letting religions of Satan deceive you. To that, Yahshua added a Prophecy that was given to Him by Yahweh to show us, today, that Satan deceives the whole world. It is possible to let no man deceive you by strictly following the Inspired Writings of Yahweh’s Prophets, Apostles, and the Savior, Yahshua Messiah, who were all in unity with Yahweh. Notice Yahshua’s Words. Yahweh’s Prophets, Apostles, and Yahshua all said, to receive Life, practice Yahweh’s Laws. But evil God worshippers, Satan being their leader, say, No!, sin is the desirable thing. Why are all nations and their religions practicing sin today? They choose to be deceived instead of choosing to practice Yahweh’s Righteousness. As a result, there are forty-one wars at this time. Nuclear war will soon come, for the same reason. 1 And at that time, one who is like Yahweh will stand up at Abel; Yisrayl, the Great Priest, who stands atAbel to teach Yahweh’s Just, Perfect Laws to the children of Your People; and there will be a time of trouble, such as never was since there was a nation to that same time. And at that time, Your People will be delivered, everyone who will be found written in The Book of Life. 7 Then I heard the man clothed in linen, who on that future day is teaching, when he held up his right hand and his left hand toward heaven, and vowed by Him Who lives forever, that: It will be for a time, times, and a half, when Yahweh will have accomplished pouring out His Power through His Holy People, all thesethings will be finished. 10 Many will be purified, and made white, and tried; tested; but the wicked will do wickedly; and none of the wicked will understand, but the wise will understand. Verse 1…there will be a time of trouble, such as never was since there was a nation to that same time. Compare with Yahshua’s Words. From this we see that Daniyl and Yahshua were prophesying about the same time of trouble. Yahshua Messiah goes on to show this to take place in the Last Generation, in which the evil of the Gods prevails. Remember, the whole world will be evil like the Gods. Take a close look at verse 17…submit to Gods; become like the Gods, knowing and practicing evil. Also verse 18, I declare to you this day that you will surely perish. Do you not know that the unrighteous will not inherit the Kingdom of Yahweh? Do not deceive yourselves. Neither fornicators, nor God worshippers (worshipers of elohim), nor adulterers, nor men who commit sexual perversions with boys, nor men who commit sexual perversions with other men. The unrighteous? Notice in the same verse, God worshippers. Remember Genesis 3:5, evil like the Gods. By the Apostle Shaul’s writings, we know that the Gods practice all of the evils that the Apostle mentioned in I Corinthians 6:9. No doubt, the religions today are following the Gods instead of Yahweh, the Creator.Revelation 12:9 shows that Satan deceives the whole world to be like the Gods, like Cain, knowing and practicing evil like the Gods. Remember, you will perish if you are evil like the Gods. …unless you repent, you will all likewise perish! Let’s go back to Yahweh’s Prophet Daniyl. In Daniyl 12:1, he refers to the greatest time of trouble ever. The time when knowledge would be increased. The time of nuclear burning. Compare: all the wicked will burn themselves up in this nuclear burning. You just read how the evil of the Gods will end. Remember, continual wars. The following article, an essay from Discover magazine, February 1984, deals directly with the consequences of nuclear war. Two scientific reports have recently been published, dealing with the probable effects of nuclear war upon the earth’s climate and the life of the planet. The first discovery is already widely known within the scientific community of climatologists, geophysicists, and biologists here and abroad, and has been confirmed in detail by scientists in the Soviet Union. Computer models demonstrate that a nuclear war involving the exchange ofless than one third of the total American and Soviet arsenal will change the climate of the entire Northern Hemisphere, shifting it abruptly from its present seasonal state to a long, sunless, frozen night. This will be followed after some months by a settling of nuclear soot and dust, then by a new malignant kind of sunlight,with all of its ultraviolet band, capable of blinding most terrestrial animals, no longer shielded from the earth by the ozonosphere. In the same research, new calculations of the extent and intensity of radioactive falloutpredict the exposure of large land areas to much more intense levels of radiation than expected. The report is referred to as TTAPS, an acronym derived from the investigators’ names: Turco, Toon, Ackerman, Pollack, and Sagan. The risks of this kind of war have conventionally been calculated by the numbers of dead human beings on either side at the end of the battle, armies and noncombatants together. The terms “acceptable” and “unacceptable,” signifying so-and-so many million human casualties, have been used for making cool judgments about the need for new and more accurate weapon systems. From now on, things are different. Leave aside the already taken for granted estimate that in an all-out exchange of, say, 5,000 megatons,something like a billion people would be killed outright by blast, heat, and radiation. Set aside as well the likely fact that more than another billion would die later on, from the delayed effects of the climate and radioactive fallout. In Mattithyah 29:33, Yahshua said “when you see these things”. Think of this. Wow! What a wonderful Prophecy. In this time period, Daniyl said that knowledge would be increased. It was in the beginning of this generation when the computer was invented, and the nuclear bomb that will darken the sun came from this increase of knowledge. All of this took place in this present, prophesied generation. Yahshua said, “when you see these things”. We can see all of these things at this time, in this generation. This generation shown in Mattithyah 24:34 is referred to as the Last Days. The Last Days is the Last Generation when the evil of God worship, which is the cause of all that the world has suffered for 6,000 years, and the wicked who will not repent for practicing and teaching it will perish. 4 Behold, all souls are Mine. Just as the soul of the father, so also the soul of the son is Mine; the soul that sins, it will die. 25 Yet you say; The Way of Yahweh is not equal. Hear now, O house of Israyl: Is not My Way equal? Are not your ways unequal? 26 When a Righteous man turns away from his Righteousness, and commits iniquity and dies, it is because of the iniquity he has done, that he will die. 27 Again, when the wicked man turns away from his wickedness that he has committed, and does that which is Lawful and right, he will save himself, and live. 28 Because he considered, and turned away from all his transgressions that he has committed, he will surely live; he will not die. This is not a punishment from Yahweh. It’s a warning showing what the religious practices are bringing. The religions are leading the nations to destruction. Yahweh is warning them, and you, to repent and be converted. Yahweh also shows that the God worshippers who are bringing this evil curse of nuclear war will not repent of their evil. 3 And the wicked will be trodden down; for they will be ashes under the soles of your feet in the day that thiswill be done, says Yahweh our Father. 4 Remember the Laws of Mosheh My Servant, which I commanded through him in Horeb for all Israyl, withthe Statutes and Judgments. Verse 1 shows us that the fire with which they destroy themselves leaves them neither root nor branch. There will be no resurrection for them. Verse 2 shows that those who reverence the Name of Yahweh, the Creator, will have extreme joy. They will be given great Authority to rule as Yahweh rules. For the earnest expectation of the creation waits for the revealing of the sons of Yahweh. These sons of Yahweh will bring peace to the universe and assure…sin never again and war no more. Read on. The system that leads the earth in the evil of the Gods today is referred to as the fourth beast, which proves to be the fourth world-ruling kingdom known as the ‘holy’ roman empire. The word holy here does not mean Righteous. Righteousness is practicing Yahweh’s Laws, which they do not do. It’s a pretense of this religion of sodomites. This roman empire, led by the catholic church, sent Titus, the general of their roman army, to destroy the temple that was originally called The House of Yahweh. Titus moved all of the temple artifacts to Rome. Even the stones of the temple were removed and the hill, referred to as Mt. Zion, was plowed like a field. From the vatican on the seven hills of Rome, the fourth beast still leads the world under the name catholic, meaning universal, which means they worship all Gods. But this woman (catholic church) that sits upon the beast is prophesied to be burned in the great nuclear burning that is soon to take place in this last part of this present, prophesied generation. 3 So he carried me away in the Spirit into the midst of God worshippers (worshipers of elohim); and I saw a woman sitting on a scarlet colored beast, full of names of blasphemy, having seven heads and ten horns. The Prophet Daniyl was inspired by Yahweh to show us who will take over after the nuclear destruction to bring Eternal Peace. Notice, the destruction comes with the increase of knowledge, starting in 1934, that leads to the greatest time of trouble ever. For details concerning this Prophecy, we recommend our book, The Mark of the Beast. There are many Prophecies detailed in this book about the mark of the beast which the whole world has upon it at this time. You need to know what this mark is. 9 I beheld until the thrones were set in place, and the Ancient of days did sit, Whose vesture was white as snow, and the hair of His head like the pure wool; His throne was like the fiery flame, and His wheels asburning fire. Verse 11 shows this whole system is involved in ruling the world by force, ultimately resulting in a great nuclear burning. The Prophecy shown in Revelation 18:9 is the same burning shown in Daniyl 7:11, Daniyl 12:1, and Mattithyah 24:29. This nuclear burning will leave only a few alive. Those few left have protection; otherwise, they would not survive. This shows just how widespread the destruction will be. Please remember the warning and what Yahweh sets before mankind, then says ‘choose’. 9 And out of the ground Yahweh made every tree grow that is pleasant to the sight, and desirable for food. The Tree of Life was in the midst of the garden, and the tree of the knowledge of Righteousness and evilwas in the midst also. Again, in this Last Generation all nations are warned. Notice, in Yahshua’s Words, the protection for the few left. In verse 22, we see this is for the Elect’s sake. These Elect are called Saints by Daniyl, in this Last Generation. Notice the Words from the mouth of Yahshua Messiah. These Words were given to Him by Yahweh to give to us in this Last Generation. A Saint is one who keeps the Commandments (whole Law) of Yahweh. Those who keep the Commandments of Yahweh and have the Testimony of Yahshua Messiah are the Saints of Yahweh. After this I saw in the night visions, and behold, a fourth beast, dreadful and terrible, and exceedingly strong; and it had great iron teeth; it devoured and broke in pieces, then trampled the residue with its feet. Itwas different from all the beasts that were before it; and it had ten horns. The army made war against those who kept Yahweh’s Laws, the Saints. Yahweh gave this into his hands. Yes, Yahweh allowed the roman catholic church to take Righteousness from the earth and to make war against and change Yahweh’s Laws. Just one example out of hundreds is the Seventh Day Sabbath. Did you know that Sunday is not the Seventh Day Sabbath, which the Fourth Commandment says to keep Holy? The Commandment says to remember the Seventh Day to keep it Holy. Sunday is not the Seventh Day. It’s the first day of the week. This was changed by Pope Constantine, who instituted the death penalty on all Seventh Day Sabbath keepers. Regardless, there still remains the keeping of the Seventh Day Sabbath for the People of Yahweh. 3 However, we who have believed do enter that Rest, as He has said: So I vowed in My judgment; They will not enter into My Rest, although the works were finished from the foundation of the world. Yahweh gives mankind free moral agency; that is, free choice. He sets before all mankind the Tree of Life, the House of Yahweh, that contains The Book of Yahweh, (Isayah 34:16) the Inspired Writings of Yahweh’s Prophets and the Apostles. And out of the ground Yahweh made every tree grow that is pleasant to the sight, and desirable for food. The Tree of Life was in the midst of the garden, and the tree of the knowledge of Righteousness and evilwas in the midst also. Notice what He says in verse 19…you must choose Life. You choose Life by practicing Yahweh’s Righteousness, such as the Ten Commandments. 5 You shall not bow down to them nor serve them; for I, Yahweh your Father, am a Heavenly Father Who is zealous for My House. The sexual sins of the fathers will be on the children to the third and fourthgeneration of those who transgress My Laws and change them. Verses 8 and 10 show that unless one practices keeping the Laws of Yahweh, that person does not belong to Yahweh. They belong to Satan and are not eligible to partake of the Tree of Life. 15 For outside are dogs, and sorcerers, and whoremongers, and murderers, and worshipers of Gods(elohim) and everyone who professes to love, yet practices breaking the Laws. Your bible says it, and mankind has proven the Writings of Yahweh’s Prophets and Apostles to be absolutely true. They do not know the way of peace, and there is no Judgment in their goings: they have made themselves crooked paths; whoever walks on them will not know Peace. The whole world is struggling to keep peace within their states or nations, but they try to force peace. No one under force is peaceful. People may be forced to tolerate, but they are never at peace. The results of force are also seen in Isayah 59. This chapter actually describes this Last Generation that has been deceived (Revelation 12:9) and is struggling because they are cut off from the knowledge that brings Peace. They do not know the way to Peace. As you read the following verses, compare them with the uprisings and 41 wars raging in the world today. You start by keeping your Appointments with Yahweh to learn Righteousness instead of learning evil like the Gods. That’s how the Saints of Yahweh are made. Surely, you can see the wars taking place now. Forty-one wars are going on at this time. How long do you think it will be before you’re involved? Nuclear wars will involve the whole world in this generation.